"Improved sticky traps prove attractive at SIVAL"
With a strong focus on protected crops, Sival attracted over 630 exhibitors and 24,000 visitors from the horticultural and specialty crop sectors. This year’s Biobest stand highlighted the osmoregulator Bluestim, the award-winning Asperello T34 Biocontrol biofungicide as well as their whitefly insecticide PreFeRal. The team also registered high levels of interest in the new improved Bug-Scan sticky traps, which feature a new integrated hanging system making them simpler and faster to use. Hanging sticky traps in a crop can prove labour-intensive. 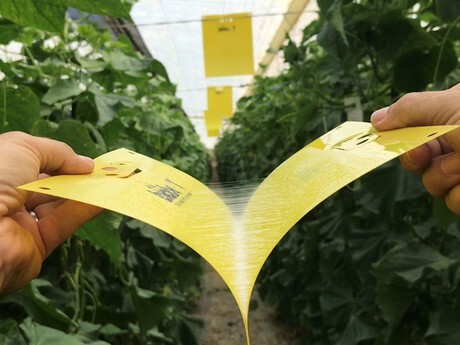 Responding to grower needs, Biobest has incorporated a quick and easy hanging system in to its popular Bug-Scan sticky traps. With an integrated hanging system, the traps can now be efficiency hung up using strips or directly suspended on the crop wire, saving valuable time. Loïc Robichon, Franck Redureau and Azélie Lelong from Symbiose joined the Biobest team at Sival to advise visitors to the stand. Based in Brittany, Symbiose was acquired by Biobest in 2017 and maintains a strong reputation within the biological protection arena in its region.